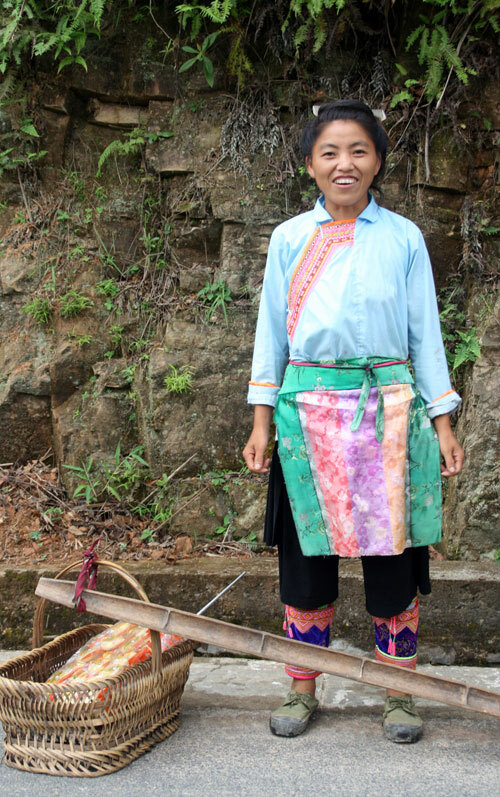 Before we could say any more she was already recommending that her ex-boyfriend, who just happened to be a taxi driver, could take us there for the modest fee of 60 Yuan for a round trip to Bakai village. And before you could say ‘Jack Robinson’ there he was ready to take us to Bakai, a village we had previously never heard of. 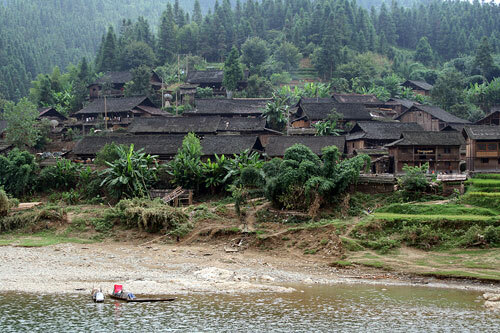 The drive along the banks of the Duliu River is gorgeous; numerous wooden villages are suspended above the bank and their houses seemingly cascading down to the river. Others are perched higher up clinging to the hillsides. Sanpans and small fishing boats ply up and down the river, fishing, and ferrying villagers from one side to the other. The local government had placed signs up everywhere encouraging families to accept the birth of a baby girl as being just as positive as the birth of a baby boy with the slogan: ‘It is equally important to give birth to a girl as it is to a boy’ 生男生女都一样. 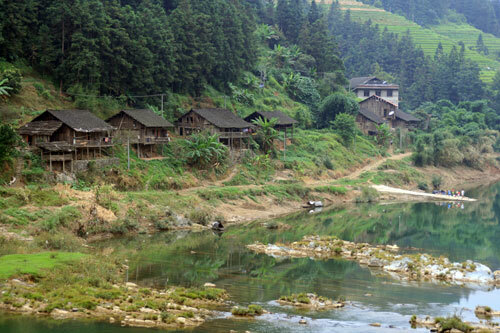 Bakai is a archetypal Guizhou minority village with large two story wooden houses, farm animals roaming the streets everywhere and dried corn kernels and bunches of chilies hanging from the balconies. 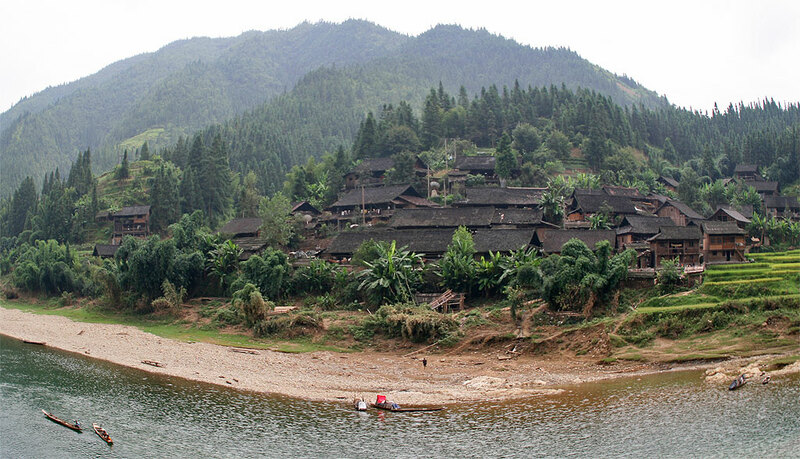 Seemingly light years away from the hustle and bustle from China’s mega cities; and even Rongjiang for that matter, Bakai has a serene, bucolic charm enhanced by its location next to the river.However, there is always a glitch in perfection. When we actually got to Bakai we were somewhat disappointed to find the village almost deserted apart from a few very ancient grannies and some young kids playing in the river. The whole town was in Rongjiang for the market. The colorful ladies we had seen in town were nowhere to be seen in their village. After poking our noses around and feeling slightly frustrated having not seen what we had come for we asked our driver to head back to Rongjiang. 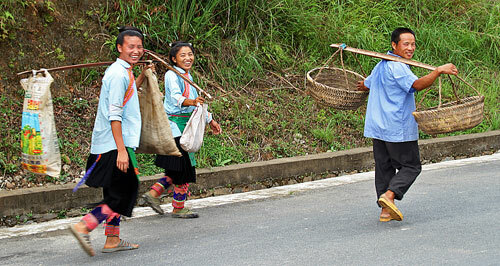 Then, just as we were driving off, three Bakai villagers came down from a hillside path onto the road. 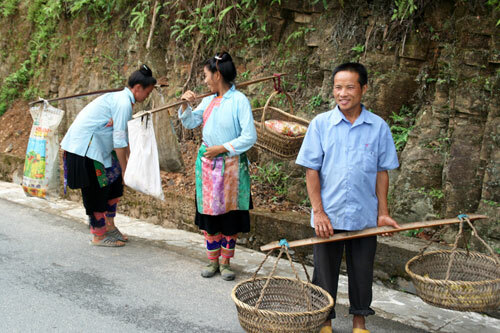 Two women and a man; the women were dressed in their finest embroidered clothes even more stunning than what we had seen in Rongjiang. Our driver braked and we jumped out. The poor startled villagers looked in astonishment as two foreigners with cameras came towards them. 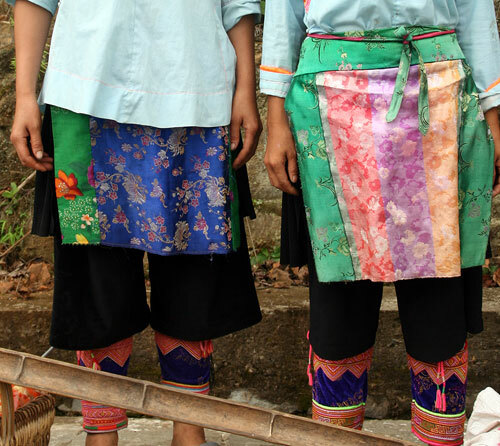 However, our intuitive driver look the initiative and told the still disconcerted Miao that we were from a foreign fashion magazine doing a report into local costumes. The faces of the three villagers’ broke into to smiles and very soon we were having a photo shoot on the road with the two ladies happily posing and encouraging us to take more photos. As you can see from the garments they are wearing. The colors are amazing. Electric greens and blues with lovely patterns. They also explained that of course nobody in the village would be wearing their best outfits while doing farm work. 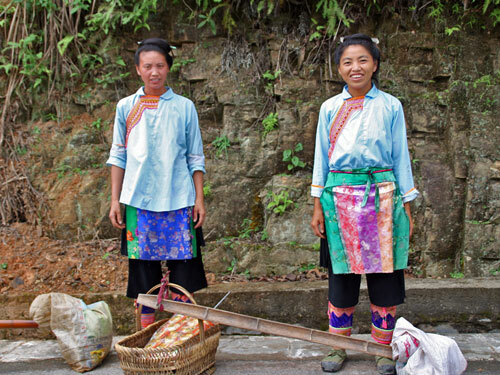 These costumes were their Sunday bests’ and were only worn on special occasions; market day in Rongjiang being one of them. After the photos a brief chat about village life and then back to Rongjiang feeling completely contented. 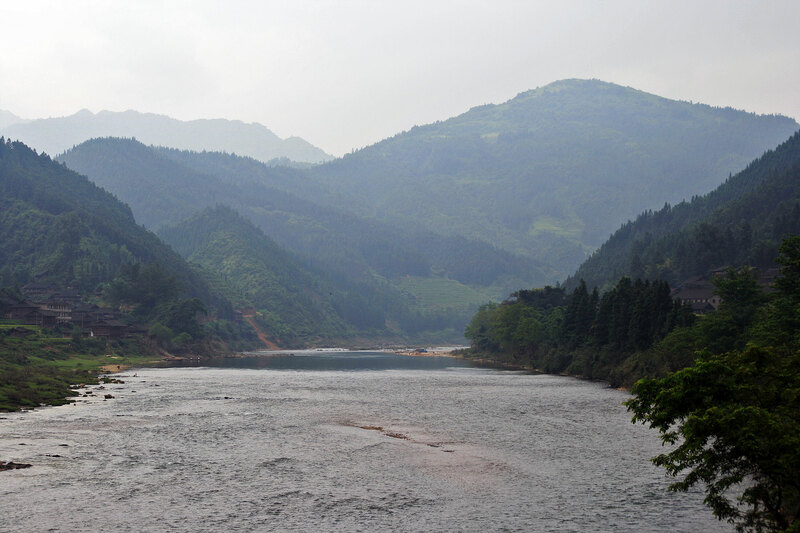 Click here for how to get to Rongjiang and for where to stay and eat.